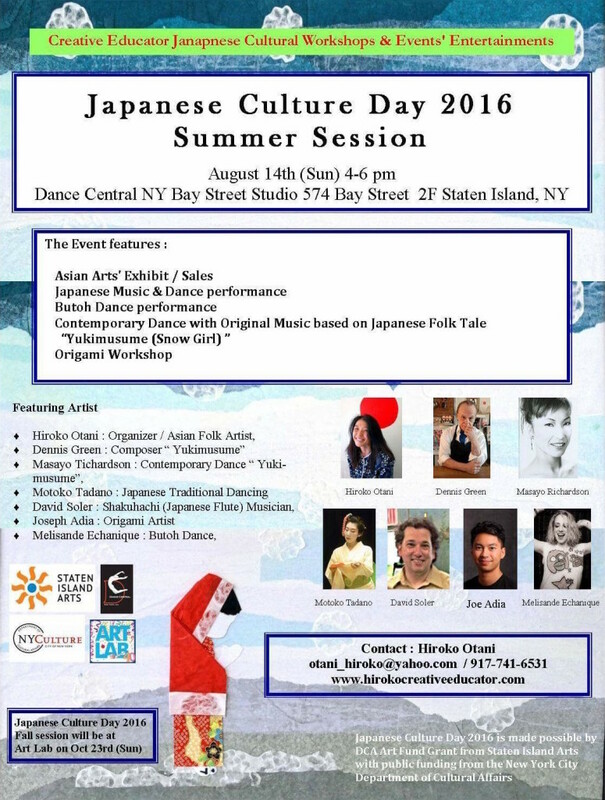 Sunday, August 14 from 4:00 p.m. until 6:00 p.m.
Hiroko Otani, a teaching artist specializing in Japanese folk arts, has been spreading the culture of Japan throughout Staten Island for years. Starting in 2015, she began offering Japanese cultural events twice a year featuring interdisciplinary art forms based on and influenced by Japanese folk tales. Last year she presented “Gratitude of the Crane,” and this year’s theme is “Yukimusume: The Daughter of Snow”. For more information please visit Hiroko Otani’s website.